Rules for Beginners - Website of flyfishingwithtom! Rule #1: Don't buy anything...YET! Rule #2: Pay attention to Rule #1. Rule #3: Get instruction from a qualified instructor -- who is not your spouse, parent, lover, paramour, etc. Being a good fly fisher does not mean one is a good instructor. Rule#5: Learn the basics before the trip. Otherwise, it's like entering the Indy 500 to learn to drive. Avoid the painful acquisition or distribution of unwanted ear jewelry. Take casting instruction, and make time to practice before you go. Rule #6: Read a little, watch a little, think a lot, then do. Rule #7: Practicing (the right stuff) yields proficiency. A good 20 minutes, three times a week, is better than a marginal 60 minutes once a week. 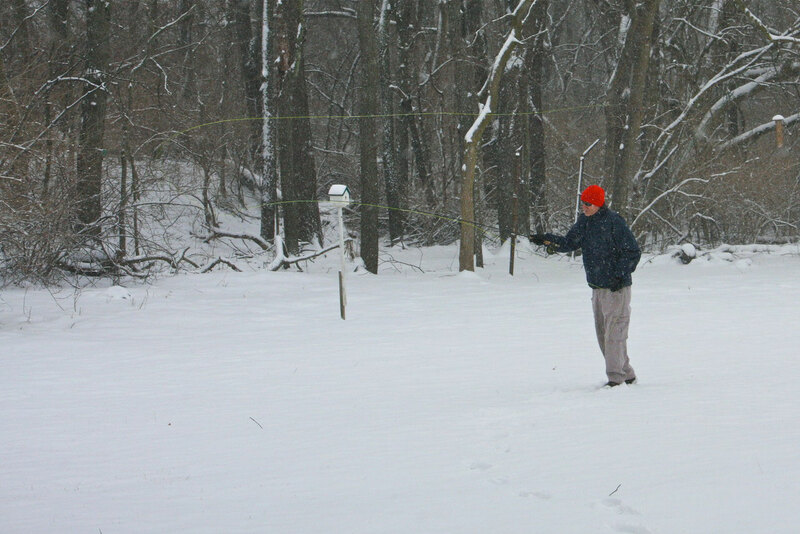 You don't always fish in ideal conditions. You shouldn't always practice in them either. Play with the wind, selectively knock some snow off branches or cast to bunny tracks one set at a time. (Click on print to enlarge).